Cross Shaft, top half, front. Top of a Cross Shaft, front view. 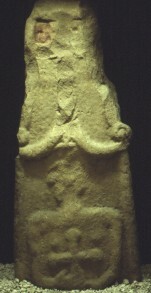 The lower part of this piece has the head and upper body of a figure, who appears to be holding a cross or possibly a sword.